A New York Times columnist and one of America's leading conservative thinkers considers Pope Francis's efforts to change the church he governs in a book that is "must reading for every Christian who cares about the fate of the West and the future of global Christianity" (Rod Dreher, author of The Benedict Option). Born Jorge Mario Bergoglio in 1936, today Pope Francis is the 266th pope of the Roman Catholic Church. Pope Francis's stewardship of the Church, while perceived as a revelation by many, has provoked division throughout the world. "If a conclave were to be held today," one Roman source told The New Yorker, "Francis would be lucky to get ten votes." 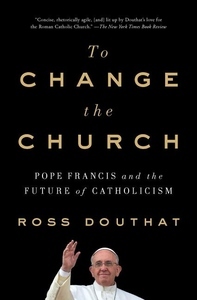 In his "concise, rhetorically agile...adroit, perceptive, gripping account (The New York Times Book Review), Ross Douthat explains why the particular debate Francis has opened--over communion for the divorced and the remarried--is so dangerous: How it cuts to the heart of the larger argument over how Christianity should respond to the sexual revolution and modernity itself, how it promises or threatens to separate the church from its own deep past, and how it divides Catholicism along geographical and cultural lines. Douthat argues that the Francis era is a crucial experiment for all of Western civilization, which is facing resurgent external enemies (from ISIS to Putin) even as it struggles with its own internal divisions, its decadence, and self-doubt. Whether Francis or his critics are right won't just determine whether he ends up as a hero or a tragic figure for Catholics. It will determine whether he's a hero, or a gambler who's betraying both his church and his civilization into the hands of its enemies. "A balanced look at the struggle for the future of Catholicism...To Change the Church is a fascinating look at the church under Pope Francis" (Kirkus Reviews). Engaging and provocative, this is "a pot-boiler of a history that examines a growing ecclesial crisis" (Washington Independent Review of Books).